The favoured vehicle for home delivery by butchers and grocers was a bike such as this. 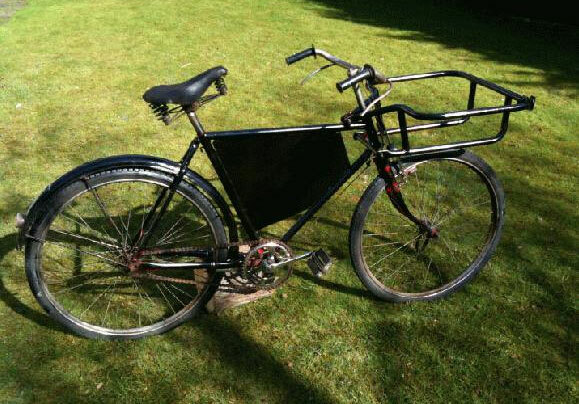 This example dates from the 1950s and is basically an ordinary bike with a carrying frame over the front wheel. The frame held a wicker basket. The panel between the cross bars usually had a painted sign which identified the shop – “Canvins” for example. Most butchers and grocers had one of these and usually a boy was hired after school to make deliveries. Compulsory pasteurization after the war finished off ll the small dairies in Wolverton as I have discussed here. Only the Co-op was big enough to manage this and post war they had the milk monopoly. Their dairy was at the back of the Co-op grocery on the corner of Jersey Road and Church Street. There was also stabling for the horse. 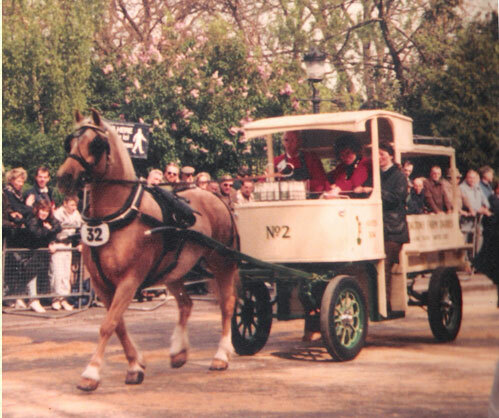 The picture above is not exactly like the Co-op milk float of the 40s and 50s, but it has many of the same features – rubber wheels, a cab for the delivery people at the front and a flatbed dray for the milk crates. 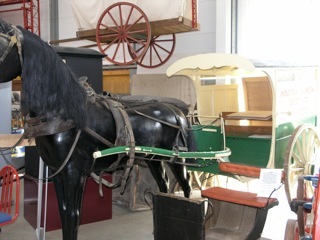 Each morning, very early, Mr & Mrs Odell would don their brown smocks, load the float and harness the horse (Dobbin?) who would patiently haul the load through Wolverton’s streets.The float itself was silent. Only the chink of milk bottles betrayed any sound. Often, outside our house, the horse would arch its tail and leave a pile of steaming horseshit in the middle of the road. Within minutes someone would come along with a shovel and bucket to recycle the offending pile as manure. The Co-op had a system of milk tokens. You would buy these from the Co-op groceries on Church Street or the Square and leave them on the doorstep – the number depending on how many pints you needed that morning. Bottles in those days had cardboard tops. On very cold mornings the top would freeze and push ff the lids as it expanded. Home delivery was a feature of life up to about 1960. In recentt years this has made a comeback in the shape of Tesco and Ocado vans. This horse drawn trap in the MK Museum was a common enough feature of Wolverton’s streets when I was a boy. Bread was obviously not heavy so this light cart was quite adequate to carry the driver and his deliveries. This one is a Co-op vehicle. We got our bread from King’s, on the corner of Radcliffe Street and Church Street – now pulled down to make way for the Agora. Mr King used to come round, usually twice a week in the afternoons with his bread deliveries. I posted about this two years ago here.